Everyday life, coupled with a bit of stress, childbirth, environmental conditions, too many unhealthy hair additives when I was younger….my hair needs a bit of healing help! Regenepure Biotin Conditioner promises to restore hair to a full and healthy thickness, with shine and vibrance. It sounded a bit too good to be true, but definitely worth a try. 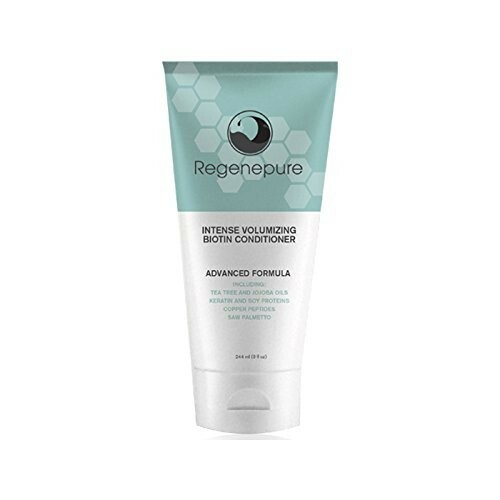 Regenepure blends vitamins including biotin, essential oils such as tea tree, jojoba, and other healthy ingredients to remove the debris, cleanse the hair, and then deeply condition it to a healthy shine. It’s safe for color and keratin treated hair and contains no harmful chemicals such as paraben and SLS. They claim it repairs damaged hair and makes it more resistant to breakage, while combating hair loss and promoting growth. It is supposed to improve with each usage. Does it work? It truly seems to. After the first use, it felt smoother and fuller, but after a couple of weeks of using, the difference is much more pronounced. It’s definitely one I intend to continue using! You may purchase these using the following affiliate link. Using this affiliate link will not affect your cost, but I receive a small amount to help support this website.